You will need an 8" (20cms) spring form cake tin, piping bag and rosette pipe.  Using butter grease your cake tin and place a parchment circle in the base.  To make the sponge place the eggs and sugar in a bowl and whisk for 5 - 6 minutes until double in bulk and creamy.  Using a metal spoon carefully fold in the flour and make sure it is all absorbed. Do not over mix at this stage.  Place in the tin and bake for 20 - 22 minutes until golden and firm to the touch.  Turn out of the tin after a few minutes and leave to cool.  Using a small saucepan cut the fruit in half and place on the heat with the sugar. Stirring occasionally bring to a simmer until soft and juicy.  Add the lemon juice and whisk in the gelatine. Place back on the heat for a minute or two until the gelatine has dissolved. If you are using leaf gelatine, soak the sheets in water for about 10 minutes then squeeze out the excess and put in the pan with the strawberries to completely dissolve.  Cool until room temp then place in the fridge until JUST beginning to set Be careful not to let the mixture set hard at this point.  Whisk the cream until soft peaks form, add the icing sugar and whisk until the consistency of a soft custard, it must NOT be stiff. 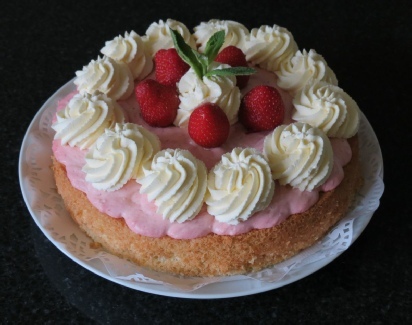  Fold the strawberry mix into the cream and gently combine together.  Spread on to the COLD sponge and refrigerate for 3 hours or overnight. 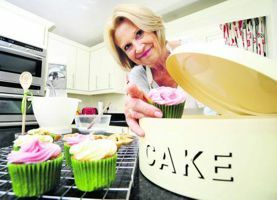  To decorate, whisk the cream until soft peaks form, add the icing sugar and whisk again until of a pipeable consistency.  Pipe large rosettes around your mousse cake and top with fresh strawberries and the tiny leaves.  Serve room temp or cold.